Wooden Propeller Forum - Propeller Identification Help Please. What is the length of the prop from tip to tip? 78" I think. Pictures posted up again. Photobucket didn't like the pictures for 3rd party hosting. Sorry. Interesting point, Bob. I forgot about the Rupp idea, even though I had a propeller with that set-up once. Do we know that these holes are only partially drilled, rather than drilled through? I thought that the drilling for Rupp fasteners were always partially drilled. Also, what do you make of the diamond shaped plate - decorative only? And what about the absence of any stamped information? I too glanced over this post several times before the name of Herr Albert Rupp sprung to mind. All the stud holes in Rupp hubs that I have seen have been both tapered and blind. Perhaps John can tell us if his are blind as well. And most or all of them had considerable ovality, much more so than on ordinary conventional bolt holes. As the ones on John's prop appear to be perfectly round we might assume that his prop is unflown. I have always assumed that a German prop with no data stamped on it is one that was not accepted by ZAK (the Zentrale Abnahme Kommission) which had two main offices in Berlin-Charlottenburg and Adlershof airfield with 46 subsidiary offices, one at each major aviation factory, referred to as Bau Aufsichts Amt (Manufacturing Inspection Offices). the shape of the plates. I have not seen anything similar in connection with a Rupp Hub. I wonder if this means that a previous owner has drilled the stud holes through to the other side to allow bolts to be fitted. I hope not. I despair of the innocent unintended sacrilege of these rare artefacts. 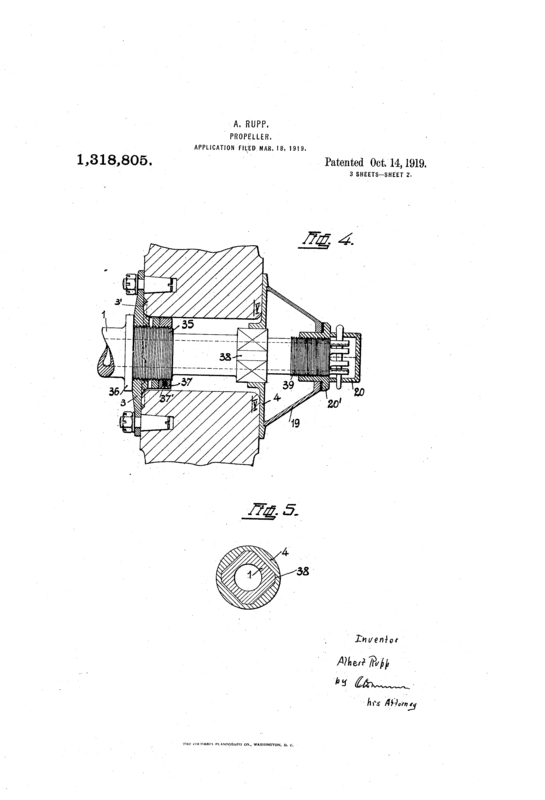 A plate was bolted or fastened to the end of the crankshaft. It had the four tapering studs mounted on it and a protruding shaft with a large nut on the end, which held the propeller tight. You are correct that a hole in the prop was necessary. I think about 6cm in diameter, much smaller than the hole in a conventional propeller hub. Shall I email you the fifteen pages from my book?